Peter Abelard was the most famous philosopher of his time. He was a brilliant lecturer. His classroom was packed with students from all over the world who traveled long distances to study with the great teacher. Then Abelard, the cool cerebral philosopher who devoted all his time to studying and teaching the logic of Aristotle, met the beautiful young Heloise and fell madly in love. The story of their love affair became one of the best known stories in all the Middle Ages. Heloise becomes pregnant and Abelard carries Heloise to his home in Brittany where she gives birth to their son Astralabe. Heloise and Abelard secretly marry in Paris (Fulbert present). When rumors spread, Heloise denies the marriage. Abelard sends her to Argenteuil convent disguised as nun to either protect her from scandal or to protect himself. Uncle Fulbert's henchmen sneak in to Abelard's house and castrate him. The scandal in Paris is without precedent. It seems that Abelard's university career is ruined. 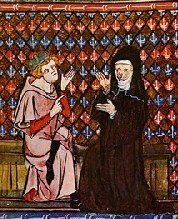 Both Abelard and Heloise decide to enter monastic orders. Abelard's teachings become more and more controversial. Council of Soissons: he is condemned. His enemy Bernard of Clairvaux is working against him. Heloise becomes Prioress of her convent. Abelard and friends try to help her and protect her. Pope Innocent II grants permanent charter to Heloise's house thus protecting her. She is always in danger (enemies). Abelard's Historia Calamitatum. Friends have copies. Abelard teaching in Paris; the scandal had not stopped him. He now is back lecturing. Death of Abelard. Heloise lives on for twenty years as honored head of her monastic institution. Death of Heloise. Both now buried in Pere Lachaise cemetery, Paris. Death of King Philip I of France (Fat Philip). Succeeded by son Louis VI the Fat (like father like son). Bernard of Clairvaux expanding Cistercian order. Peter Abelard lecturing at cathedral school, Paris. Abelard huge success. Begins life-long duel: Bernard the mystic Abelard the Aristotelian rationalist. Abelard meets Heloise. They begin their affair. Heloise pregnant. Birth of son Astralabe. Scandal of the action against Abelard by her Uncle Fulbert's henchmen. Council of Soissons. Condemns Abelard's teaching. Birth of Eleanor of Aquitaine. Father is Duke of Aquitaine. Eleanor of Aquitaine marries King Louis VII of France. Complete facade of Saint Denis in north Paris. First Gothic building in France. Death of Abelard. Bernard has outlived his lifelong antagonist. Dedication of new abbey church of St Denis in Paris. Queen Eleanor & King Louis present. Birth of Eleanor and Louis' daughter Marie de France. Marie is later a great inspiration for the world of Courtly Love. Her court becomes important center & she is a poet. Second Crusade. Queen Eleanor goes too. Death of Abbot Suger. Suger the genius behind success of French government early 12thC. Henry, Duke of Normandy, now becomes also King of England. Beginning of the Angevin (Anjou) Empire, both sides of the English Channel. Thomas Becket, Archbishop of Canterbury, Second most important man in England. Closest friend to King Henry II. Begin construction of Notre Dame of Paris (the one we now see). Finish west front of Chartres. One of first Gothic cathedrals. Death of Heloise. Chretien de Troyes writes Lancelot (Courtly Love romance). Murder of Thomas Becket; crisis for King Henry. Death of Eleanor's former husband, King Louis VII of France. Louis succeeded by his son Philip II called Philip Augustus. Moslems conquer Jerusalem. provokes new Crusade by Christian West. Death of King Henry II of England. Richard the Lionhearted succeeds to the throne. New power for Queen Mother Eleanor of Aquitaine. Gather Third Crusade at Vezelay, France. Extraordinary gathering of the kings of Europe. ENGLAND: Citizens of London given the right to elect their own mayor. Increasing independence of London from the crown. King Richard on Crusade captured in Yugoslavia. Held for ransom by agents of the Holy Roman Emperor. Eleanor raises ransom. Rides to Rhineland meeting to save son. Dramatic journey across Europe for the grand old Queen. Crowds greet her on way and on return. Extraordinary scene in England: Queen Mother brings home King Richard. Death of King Richard. King John succeeds (Robin Hood doesn't like). Eleanor once again influential. Death of Eleanor of Aquitaine: Duchess of Aquitaine, Queen of France, Queen of England, Queen Mother to two kings of England and four queens. An excellent outside resource for all things Abelard and Heloise.